Founded as a fortress charged with pacifying the land, the city of Korvosa has endured numerous hardships in its 300 years of existence. Despite (or because of) that, the city continues to prosper. This cast-off colony of infernal Cheliax is famous for its imposing Castle Korvosa, its renowned Acadamae, its extensive Vaults, and the frequent high-altitude clashes of imps and pseudodragons. Adventuring awaits brave residents and visitors witin, beneath, and even above the city. From the otyugh-infested sewers of Old Korvosa to the ever-shifting makeshift paths of the Shingles, Korvosa offers restless PCs all manner of opportunities for mischief and glory. 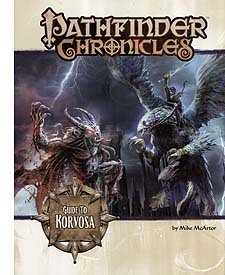 Pathfinder Chronicles Guide to Korvosa includes an in-depth look at the people, places, and history of Korvosa, Varisia's largest city. Except for a short chapter of Korvosa's many secrets, the entire book is filled with information safe for players in any Korvosa-based campaign, including Pathfinder's Curse of the Crimson Throne Adventure Path. Better yet, only the 3-page appendix contains any game rules text, making the Guide to Korvosa useable with any edition of any game!